Make Dal Ki Missi Roti Ka dough? Missi Roti is so delicious and healthy at the same time. Especially in Indian families it is very popular. I’m going to share this Recipe, because I’m using it for last 30 years. Some people use Besan(Chick Peas flour) instead of Corn flour. But I prefer Corn flour, because it makes Missi Roti more tasty and gives the flavour of Makki De Roti too. I always use 2:1 proportion of both whole wheat flour(two) and Corn flour(One) respectively. Always my purpose of Making Missi Roti is to add more Green Leaves and just for the taste onion as well. This is the best way to give green leaves to your family and this way those Kids, who don’t like to eat much Vegetables, they also eat Missi Roti and not only they eat, but also Enjoy eating it. I have already shared a ‘Green Leaves Missi Roti Recipe at Home‘, which you can watch at my YouTube Channel. So there are so many ways to Make Missi Roti. 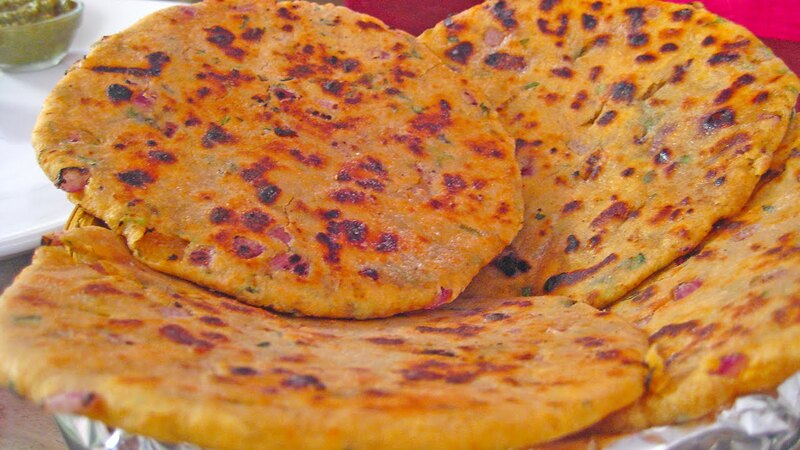 Missi Roti can be served hot from the Tava with Plain Yogurt, Butter or any Sabji. Usually I make Missi Roti for the Breakfast, otherwise you can eat it for lunch, for Dinner and give to your School Going Kids in their lunch Bags. Baby Spinach bought from the Market. Make Missi Roti and serve hot with Plain fresh home made Yogurt.